When offered to review another DAP and one labelled as ATC I have to confess my eyes initially lit up thinking this was a product from the Stroud based and well renowned loudspeaker manufacturer. This is a different company but no less a disappointment for me from the moment I unpacked the unit. ATC EnergyTech Corporation Limited is a Hong Kong based company set up in 1997 specialising in power packs and supplies with a small base in central London, a company with impressive credentials becoming an authorized manufacturer of Apple’s accessories in 2010, including Apple’s Lightning accessories. The HDA-DP20 is the most expensive the company produce, though at £289.95 is still a small sum for a top model. The build and specification of this device is first class, and surprisingly good for a first generation of machines; just look at how primitive early generations of number of DAPs were and how much better they are now, as is the same with Kia and Hyundai cars! This is seriously well made audio and well worthy of review. 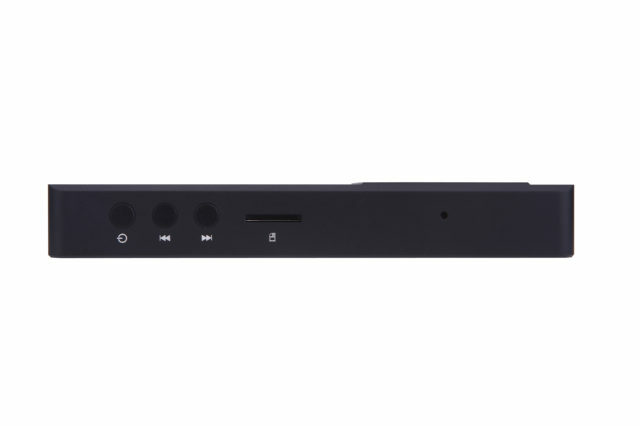 The Linux based HDA-DP20 is one of three DAPS made by the company, being designed in the UK and Hong Kong and built in China. 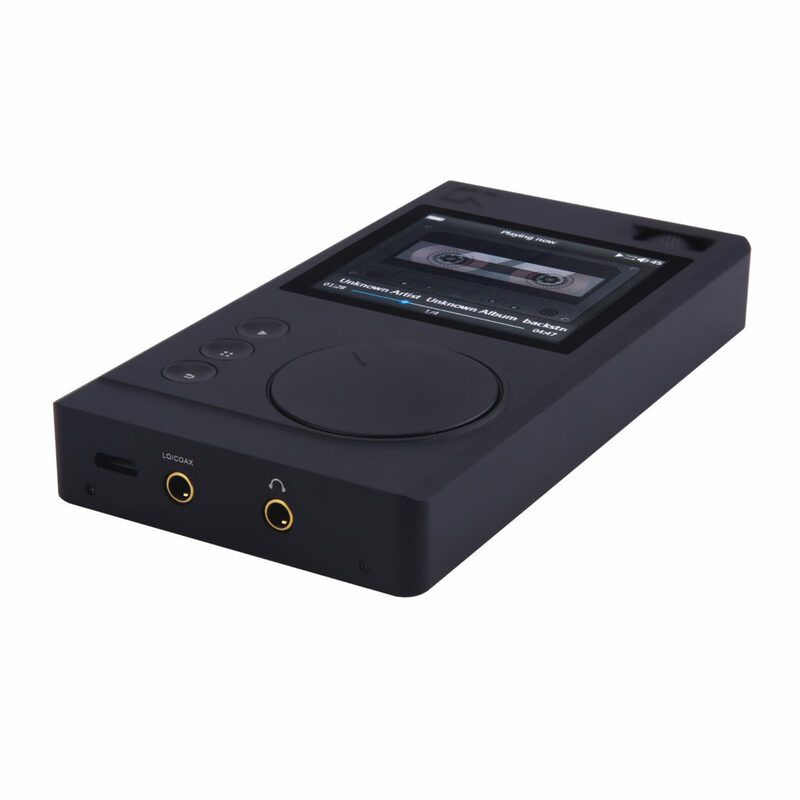 The HDA-EL2 is their starting model with a small mono screen, but still playing all high definition audio formats including FLACs and DSDs. 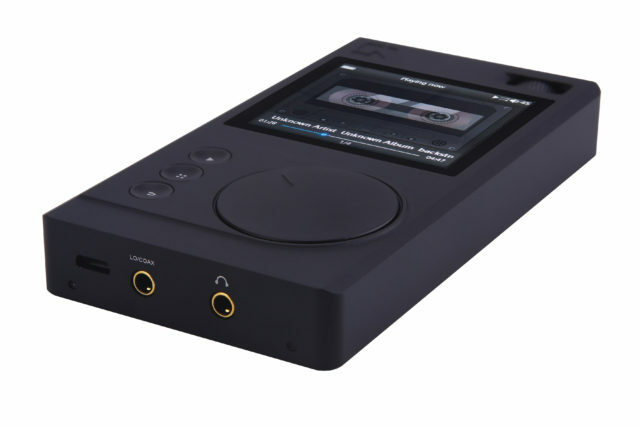 Their £199 HDA-DP10 is a well-endowed product with an Injenic JZ4760B audio processor & AKM AK4490 DAC. The top model reviewed here is the HDA-DP20 and is only £90 more and comes complete this time with twin Wolfson WM8740 stereo DAC chipsets followed by AB8610 LPF (low pass filter) then feeding into twin Analog Devices AD8397 input amplifiers. Having twin amplifiers and DACs provides a natural, detailed and engaging sound, with each channel working independently as one would expect from professional digital designs. Whilst magic words like Sabre are missing in the equation, the WM8740 is still an exceptionally able DAC, as used by Cambridge Audio DacMagic and some excellent DAPs including Astell&Kern AK120. What really is important to stress, though, is how all the components around that DAC chip work together. The correct combination is worth much more than the individual parts, and they certainly do work well in this unit. Topped off with a solid aluminium construction and protected volume control makes for a seriously good value product. All that is missing is Bluetooth, and having two microSD card sockets instead of one. Like many DAPs the unit has no internal storage, but what is really good to see is a good quality 32G microSD packaged with the unit. Very kind. Whilst 32Gigs could get you around 30 decent quality albums, the unit will accept up 200GB microSD cards to top up your collection. The hole to put in the card is very thin, so you will need a pen to push it through, but this is typical of today’s portable units. I would rather it had a cover to protect the card but that would put up the cost, and is it really is not an issue. Battery life is average at around 9 hours with 4 hours to charge the unit. The unit plays FLACs up to 24/192 (and not 32/384 as indicated in a review elsewhere) and DSD64, meaning most of my music could be played on the unit during the evaluation. Only the absence of Bluetooth playback spoiled an otherwise excellent specification. 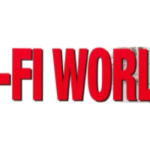 Future models being planned by the company will include larger screens and DSD128 and 32bit FLACs, though there is no date for production as of writing this review. However, for £290 I am not disappointed. Far from it. The unit is solidly built, at 168g being relatively heavy for a model of this size (61 x 16 x 112mm). The finish is a matt black, and brick-like with almost straight corners and looks very stylish and not quite so outlandish as a few more expensive DAPs I could name. The off/on and forward/back buttons are at the side, with important buttons that you don’t want to press unless you actually have to do so that on the front of the unit. These buttons are cleverly slightly recessed in shape meaning that you can’t press them unless you actually need to do so, even with big fingers. These allow you to select your music and play or ‘pause’ plus niceties such as adding to favourites, shuffle play or creating a playlist. 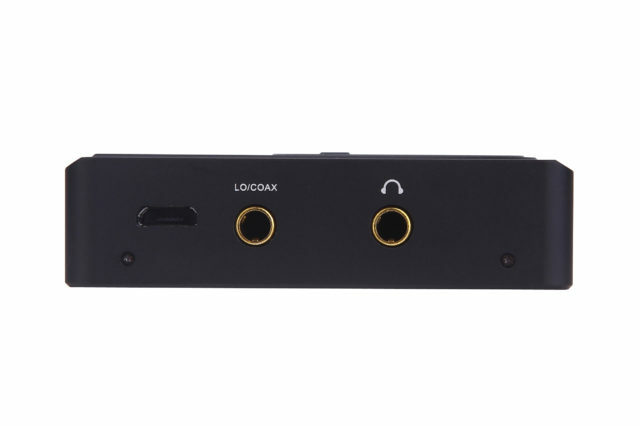 Here you can also delete individual tracks (many DAPs don’t have this facility so easily performed) as well as to get to the system settings, plus you can change EQ and choose the second 3.5mm socket to play line output or coax digital play and other system niceties such as how long the screen displayed, screen brightness and firmware upgrade. 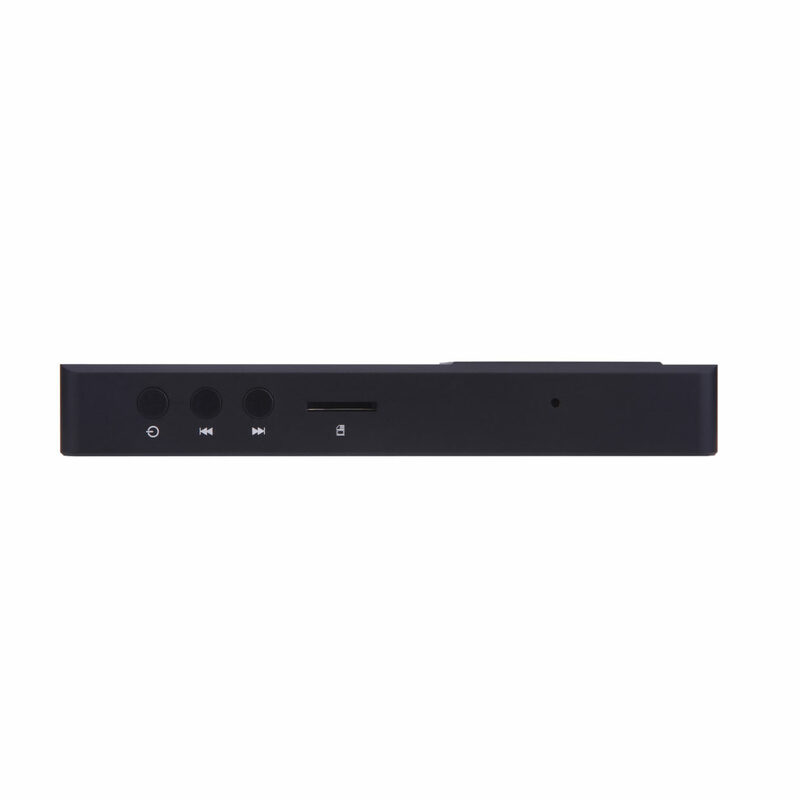 The volume control is cleverly placed so you can alter it from the front or rear of the unit. The only irk is that the headphone socket (which is next to the line/coax socket) is at the other end of the unit rather than next to the volume control. The wheel on the front has a ridge to help operation, and being matt finish to match the rest of the unit was easy to operate, and not slipping. The wheel is not loose like many, and the action works well, unlike a few DAP I know well. The 42mm x 38mm screen resolution is excellent, being IPS (In-Plane Switching) as opposed to TFT. Using my AT W1000 headphones there was a clear presentation of all the music, particularly in mid-frequencies, such as vocals and strings, only missing out slightly in the very deep bass. Initial transients were full, and the almost velvety presentation was very analogue in sound, with very few little digital spikes in the sound. This is a great attribute to have; music in so many DAPs today comes across as too “digital” and unreal. Pink Floyd ‘The Wall’ and the track “Comfortably Numb” was almost appropriate. Nothing stood out, the music comfortably playing, if perhaps slightly less excited as I would like, but not numb! Moving to the higher impedance Sennheiser HD650 the sound was fuller, but playing Pink Floyd ‘The Wall’ and the track “Hey You”, there was not enough reserve to get a bountiful presentation. I just wish someone would put in an op amp with several Watts of oomph. The cheaper Meze 99 Classics gave a very full bass though these cans are not quite so good at the highest regions. For my serious listening I chose to use three IEMs of different abilities, starting with the Flare Pro IEM. As this machine has no Bluetooth facility I used the PRO as a wired IEM, rather than using its BT module. This was no disappointment, as DSD and FLAC files could be listened to, which they cannot using basic aptX BT. When turning on the machine after closing it down mid track the previous occasion it can be set to continue from where it was left off, and even fades the music up as it starts. A lovely idea. Thomas Sondergard Sibelius Symphony Number 2 (BBC National Orchestra of Wales, 24/192) was nicely presented with notable detail and musicality that allowed me to get close to the music. One slight criticism is the sound was a little bit too laid back for my liking. 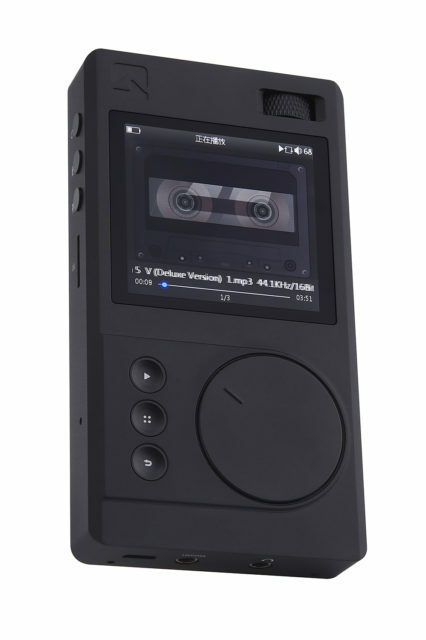 The excellent screen shows a cassette tape playing music if your track does not come with its own jpg image. 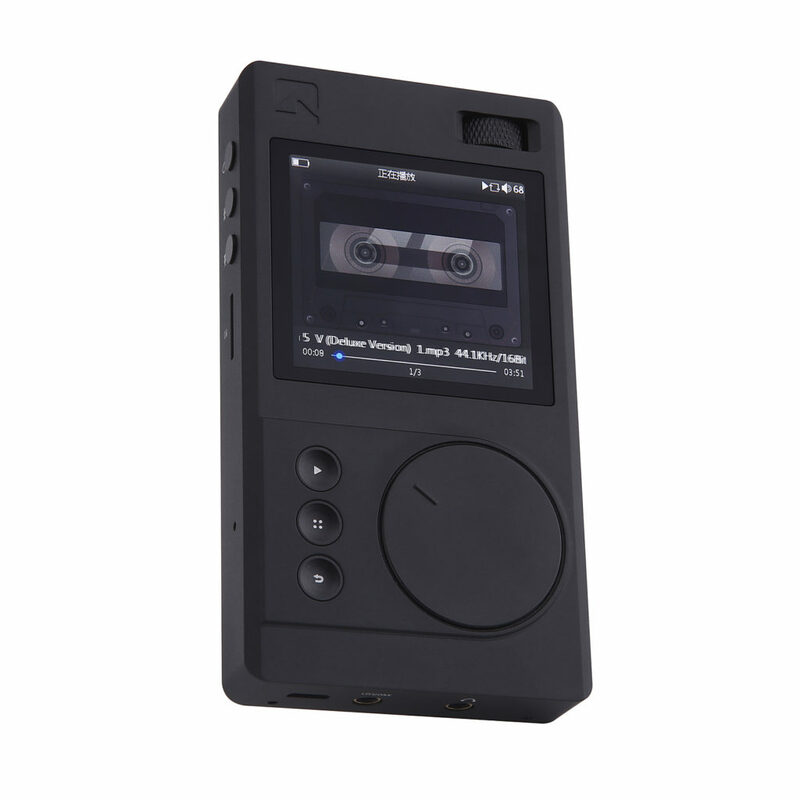 A cassette tape is appropriate; the clear but smooth and analogue performance could easily be coming from a Nakamichi Dragon, but nothing less than a Nak! The Eagles 1976 album ‘Hotel California’ (now on 21st Century 24/192 FLAC), recorded in the good old days of 2” 24-track analogue Studer multitrack recorders was similarly very analogue in its performance, recorded with detailed positioning of all instruments and with a very prominent bass end, only missing out in detail at the extreme bass end, sounding a tad loose. Track “Wasted Time” was certainly not the case, with clear and well-presented musical passages between the string and guitar. Johnny Cash ‘American IV’ (24/192FLAC) and the track “The Man Comes Around” is full of acoustic guitars and piano and the closely mic’d Mr Cash. The detail of the vocal and metal strung guitars is highly infectious. His spoken voice is so clear that he could well have been sitting in front of me. Vocals are prominent in the ATC. Playing other vocal music I know so well – including my own albums – that was a consistent observation. It is not that they are too loud, just that they are very clear and can sound slightly less “analogue” than other frequencies. The Kinks’ Misfits is a good album to listen to vocals with Ray Davis’s distinctive voice. Similarly Katie Melua ‘In the Winter’ and “Perfect World” gave me a chance to test the vocals and all those mid frequencies. Whilst the low bass drum thuds were not quite so prominent as on my reference DAP, vocals were clearer and brighter and the awful hiss heard at the start and end of many of the tracks was more noticeable than I had heard before. René Aubry “Amnesia” has plethora of instruments and sounds, all positioned at extreme points from hard left to right including piano, different percussion instruments as well as the sound of a didgeridoo and clarinet. I love this track and the ATC allowed me to get engrossed in the sound. René is a French composer born in 1956, and like me a multi-instrumentalist known for blending classical harmonies with modern instruments and sound bites, who writes much for film. Playing on my reference DAP the sound was brighter and more detailed with a weightier performance, but the ATC sounded more musical, and I found that I preferred the ATC to any of my DAPs. Paul Personne “Ou est l’Paradis has a forward drum with tenor saxophone and guitars as well as vocal. This for me was the icing on the cake. A clarity and musicality in this live performance including a very close mic’d Hammond C3 organ coming from nowhere mid-way in the track. This was a sheer delight to play, showing that the unit had no problems in performing complex and demanding music. Nils Lofgren “Keith Don’t Go” is an acoustic guitar and vocal track performed live that had me toe tapping. Only the lower notes of the guitar and initial transients weren’t quite so realistic and as fast as through my reference DAP player/Class A headphone amp combo. But I actually preferred to listen on the ATC. Funny that. Manufacturers have tried to replicate an analogue sound from a digital source for many years, for example Pioneer’s “Legato Link” in their CD players. This player allows you that pleasure. Reverbs were allowed to end properly and the atmosphere in performance was clearly distinguishable. The ATC team not only work on traditional audio concepts and technologies, but they also have tuned ears with experience of the live sound and music in different venues such concert halls, stadiums and night clubs, and this helps them to recreate the sound more musically. The company motto is “Living in Music” and their aim is to turn the acoustic technology into real, living music. They certainly are succeeding. I have to admit this unknown-to-me brand exceeded all expectations. Not only did it look upmarket but it performed in a way that exceeded its price point. If you want to hear musical detail and engagement but perhaps sacrifice a modicum of detail in the lowest bass then this should definitely be on your shopping list. The machine performed with feeling, creating a warmth and velvety performance that was highly engrossing and analogue. Definitely worth a listen. Build Quality: Exceptionally good build quality with a matt finish. Well-hidden screws and a design you will either love (as I did) or otherwise think it is too square. Sound Quality: Analogue feel to the sound, with only slightly less detail in the lowest frequencies. Value For Money: At a few pennies short of £290 this is an excellent DAP for those who don’t need Bluetooth but want to enjoy all their music.